If you want your child to become an adventurous eater when she gets to preschool, there are things you can start doing now to help her become one. There is a time, at around five to nine months (every baby is different and age is NOT a definite determining factor when it comes to these things) when your baby will start showing interest in solid foods. She’ll start putting toys into her mouth, watching you eat with interest, and reaching for whatever you have on the table. This is the time when you can jump in and start laying down a foundation to help her develop good eating skills, such as being excited about eating, wanting to try different foods, learning to feed herself, being pleasant at the dinner table, and partaking in future family meals. Before all that happens though, your baby has a couple of milestones to achieve. The first milestone is to be sitting in a highchair and being able to eat off the spoon with enthusiasm. We’ll talk about the second one in another post. How do you get to this first milestone? STEP 1. Make sure your baby is ready for something other than breast milk or formula. She’ll be able to sit up and keep her head up; open her mouth and keep her tongue down so you can place the spoon inside; she’ll turn away when she is done; she’ll close her lips around the spoon; she’ll play with food, and so forth. If you feel like most of your time at the table is spent on gathering that yolk off your baby’s chin and putting it back into her mouth so that she can spit it out again, then she is probably not quite ready yet. And it doesn’t make it fun for her and certainly not for you. Go back to the bottle or breast and wait for another few weeks. STEP 2. Apply no pressure. Just like you don’t pressure your infant to breastfeed when she is pulling away trusting her that she had enough, you don’t pressure your growing baby to eat off the spoon when she is turning her head away from the spoon. Pressure takes all kinds of different forms, most common at this age are leaning over towards your baby ‘crowding’ her space and cheering her on. Neither one of these help your baby. The more you try to get her to eat, the less enthusiastic she will become. So lean back, meet your baby halfway and talk to her about food without being overly cheerful. STEP 3. 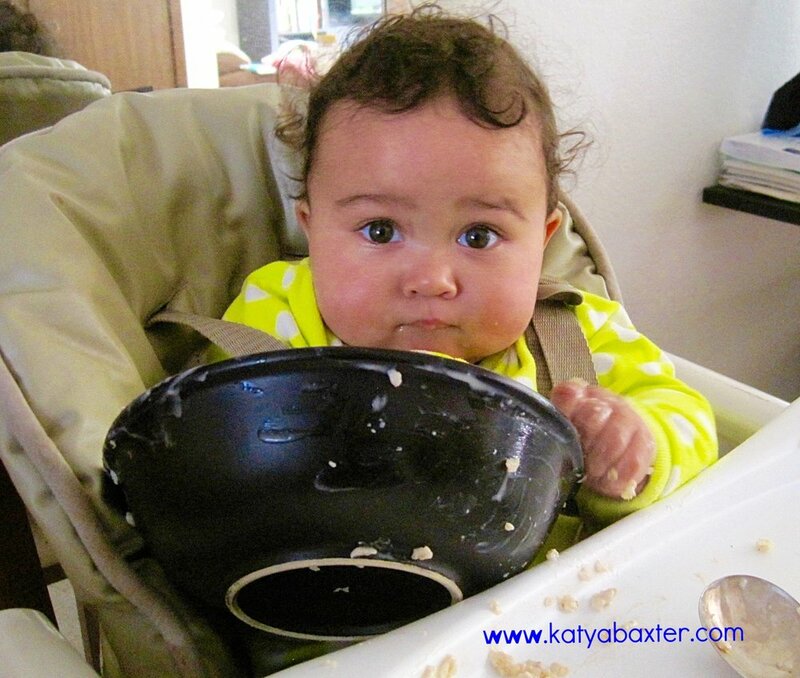 Hold the spoon 10-12 inches away from your baby’s mouth. Wait for her to lean forward and open her mouth to show you she is ready. Follow her lead and stay tuned to her rhythm and speed. Prepare another spoonful when she is done chewing and swallowing and again, hold it 10-12 inches away until she shows you she is ready. Give these three steps a shot and see what happens. Remember, your baby wants control. It is normal and you need to give it to her in an appropriate way. Continue to learn to read her cues, follow her lead, don’t interfere and support her changes. Follow your instincts. A good rule of thumb is that if you are not enjoying it, then your baby probably isn’t either. See if you are trying to take control from her and adjust. There is no age requirement for these things to take place. By now you have probably noticed how different every single child is. The key is to wait until YOUR child is ready. This will determine whether or not she and you will have fun feeding and being fed. As soon as you try to follow your own, or your friend’s, or your pediatrician’s agenda and feed your baby because it may help them sleep better or because they ‘should’ since they are already six months old, you are starting to interfere with your baby’s internal mechanism, which guides their internal developmental processes. Don’t do that. Instead, and I’ll say it again, tune into your baby’s internal ‘language’, give her the control she wants, and follow her lead. It will make it enjoyable for her and for you. You will also be laying the foundation for the future development of her eating skills, like finger feeding herself and eventually partaking in family meals around dinner table. Older PostBe a star: play a guessing food game with your kiddo.